In the South Hams we are lucky to enough some wonderful Christmas Markets, and festive days out, along with boutique shops to find the perfect gifts for loved ones. Need to kick start your Christmas shopping? Haven't found that perfect outfit yet for the Christmas party? Or want to stock up on wine, cheese and other goodies ready for the festive season? Pack up work for the day and head to Kingsbridge Fore Street for some extra special and super indulgent late night Christmas shopping on Wednesday 21st November. With over 26 participating shops and all open until 7pm, there are discounts to be had and mulled wine to taste. It's the perfect opportunity to browse with friends, stop for a coffee, and perhaps even make a night of it with The Old Bakery offering 10% off dinner to anyone with a receipt from a late night shopping purchase. With loyalty schemes available, discounts on offer and no delivery to pay, shopping locally really can be cheaper than shopping online. Plus by visiting in person, you'll get to touch the gifts you buy, try on that pair of shoes, and make the most of the expert knowledge our shops can offer. Online retailers just can't beat a Kingsbridge smile and a bit of a gossip, all topped off with quality service and the occasional free sample. Just imagine, you, with your friends, enjoying a glass of red wine, smug in the knowledge that you've done all your Christmas shopping and supported your local high street all in one fantastic evening! Join us in our Yarmer Suite for an evening of Christmas Shopping, Canapes and Prosecco. With over 24 local trade stands attending you will be sure to find something for everyone. Why not make a night of it and stay over, rooms from £75.00 per person to include bed and breakfast. Merry Christmas and welcome to the start of the 2018 festivities! What better way to start the season that a visit to Kingsbridge Celebrates Christmas on Saturday 1st December? Bring your hampers and start the day at the Farmers Market, selecting all your festive foodie treats from local producers. As you browse listen to the carol singers perform and keep an eye out for Father Christmas as he arrives in style. Children can visit him in his grotto and receive a gift, all for free thanks to local sponsorship. Adding to the magical atmosphere will be live music and entertainment from the Kingsmen, Carousel, Elfick and many more. Shops with their brightly lit windows and costumed staff, will be offering one-off promotions. Stalls lining Fore Street will be laden with a wide variety of wonderful gifts and festive treats while the Family Church is hosting the craft fair, the perfect place to find beautiful handmade trinkets and decorations. If they haven't made one already, take the children to the Christmas lantern making workshop hosted by Santa's Elves in the Family Church. Follow the lantern procession through the town and end the day on the Town Square where you can witness the Christmas lights switch on and children can dance around at the Christmas Disco! Take a look at the full line up opposite so you don’t miss a thing and keep up to date by liking and following the Kingsbridge Celebrates Christmas Facebook page. Totnes market square will once again play host to its diverse and eclectic mix of Christmas stalls this year. The "Totnes Night Market" is run by market traders. Our vision is to host an event for and with the local community encouraging locally based traders, producers and entertainers with a touch of Totnes Christmas Magic!! 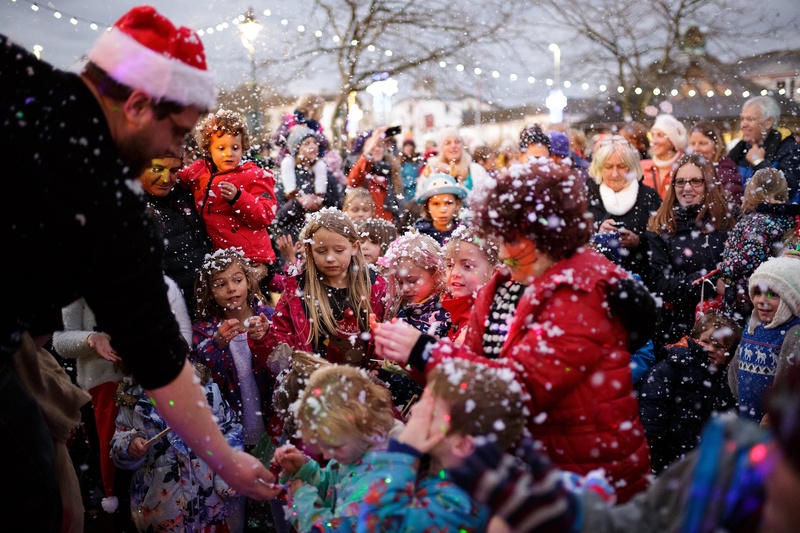 With performances from local schools, community choirs, local bands, drummers, lantern parades and a Santa's grotto, you will be charmed and entertained. Delicious food, local cider and mulled treats will wine and dine you as you Christmas shop in these unique Christmas markets, which can only belong to Totnes! !